Astronomers need dark skies to see the stars, but did you know they also need quiet skies? Learn more about radio astronomy, and the noisy world we live in by participating in the Quiet Skies Project. We’d like to introduce you to your noisy world and the challenges astronomers face in trying to investigate the radio universe. Join in a global effort to determine just how quiet your skies are, by measuring radio pollution in your community! There’s a lot more to the universe than meets the eye. Gigantic radio telescopes all over the world from down under in Australia to the high plains of New Mexico study cosmic objects that emit radio waves. Similarly to optical astronomy, radio astronomy can be done from the surface of the earth. And, like modern optical telescopes, we build large reflectors to intercept and focus radio waves that stream in from objects in the cosmos. Some of the objects we study may sound familiar: comets, nebulae and galaxies to name a few. Radio astronomers also observe signals from some of the most extreme objects in the universe—like neutron stars and black holes, and some of the most extreme events—like the Big Bang! But these signals are weak by the time they reach Earth having traveled enormous distances. Where-as your cell phone detects radio signals that are 1/100th of a watt, radio telescopes have to detect signals that are only 1/100000000000000000000000000000th of a watt! That’s why radio astronomers need quiet skies. In the same way that man-made light obscures our night sky and blinds ground-based optical telescopes, man-made radio signals effectively blind radio telescopes as well. We call these man-made signals Radio Frequency Interference, or RFI. Be an RFI Detective in your home. Using a simple portable AM radio, search for sources of RFI. You’ll be amazed at what you find! A great activity for younger scientists! Collect data and report the results to the Quiet Skies Database, and help us build an interactive global map showing RFI. Have a laptop and a WIFI card? You can measure RFI from wireless access points using cool free software! Fifty Quiet Skies Detectors are available for loan to museums, schools, and clubs, in the U.S. for those who want to do activities with informal groups. If your organization would like to purchase Quiet Skies Detectors, contact Sue Ann Heatherly (sheather-at-nrao.edu). The Quiet Skies Project was developed by the National Radio Astronomy Observatory (NRAO). NRAO is a facility of the National Science Foundation, operated under cooperative agreement by Associated Universities Inc.
Where’s the astronomical signal in this typical radio spectrum? Everything in this plot is RFI except for the tiny line at 1420 MHz which arises from hydrogen in our Milky Way. Yet, this line is one of the strongest radio spectral lines and one of the most important astronomical probes of our Milky Way! 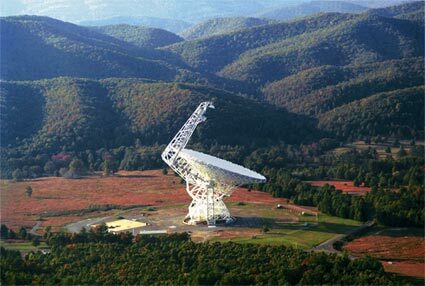 Gigantic radio telescopes like the Green Bank Telescope in West Virginia, are located far away from cities, where the skies are relatively quiet!